Arranging furniture properly can improve the look of your home design by highlighting focal points and architectural features. Keep reading to learn home staging tips and tricks that will create better traffic flow and the illusion of more space in your home. Your ultimate home staging goal is to sell your home quickly and for more money! Applying basic home interior design rules like; formal and informal balance, scale, proportion, line, rhythm, traffic flow, color and patterns, will help you make better furniture arrangement choices. The shape and architecture of your rooms can also guide you in successfully arranging furniture in your home. See space planning for decorating tips on working with different room shapes. 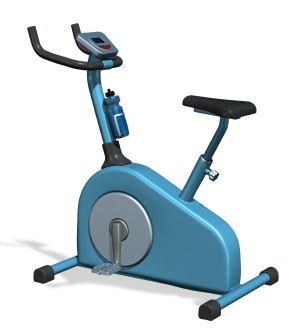 This exercise bike doesn't belong in a staged bedroom! Before moving furniture around, think about the function of each room. Also, determine whether the room has one or more focal points. Some rooms will not have a focal point, so you may need to create one. Arranging furniture into separate cozy conversational areas can give the feeling of two rooms. Each separate area can be assembled and directed toward its own focal point. Arranging furniture to suit the needs of each space will make your rooms more functional and guide you in the selection of furniture. Furniture not fitting that need should be left out. For instance, that exercise bike in your master bedroom... it doesn't exactly fit in with the "peaceful retreat" theme that you should be presenting to home buyers. The open floor plan is a greatly desired feature in home design at this time. Prospective buyers are looking for that spacious feeling with good sight lines that an open floor plan offers. The open floor plan releases the family chef from their kitchen prison so that they too can partake in the conversation while they cook! Also known as the "great room", the open floor plan typically encompasses a living room, dining area and kitchen. 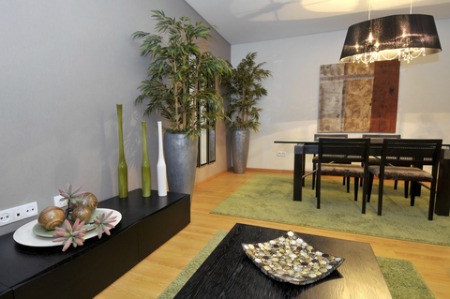 Spaces flowing into each other can be an interior decorating challenge for arranging furniture. Area rugs can help define a space and create the feeling of separate zones. Float furniture on top of an area rug in the living room and place another under a dining table. For a comprehensive guide on area rugs and how to select the best shape for any space, go to Cottage and Bungalow's Ultimate Rug Guide. 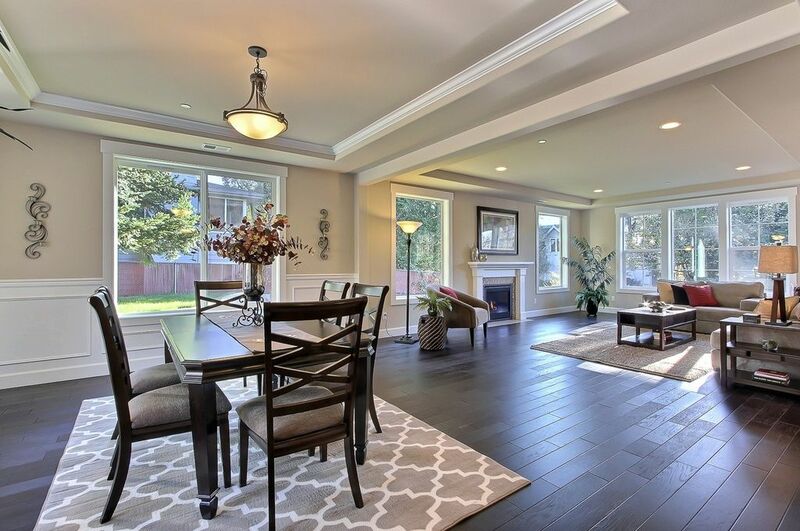 Flooring can separate zones as well; tile in the kitchen, wood in the dining area and maybe carpet in the living room. Note that separate styles of flooring can often make a great room appear smaller by breaking up the flow. Flow is created between these rooms by using repetition of color in the furniture and accessories. The sofa is situated for easy conversation between each area. The rug defines the living room as a separate zone. Paint the walls of each room the same neutral color, or use paint colors from the same palette. Keep fabric colors similar and coordinate patterns from one room to the next. Folding screens, see-through shelving, half walls, or columns can be used to create separation. A distinct focal point in each room that shows the function of that room will act as a natural room divider. A fireplace will define the living room, a chandelier will define a dining space, and so on. Every home has certain features that make arranging furniture a challenge. In my last home, many of my home design plans were foiled by baseboard heaters and an ugly metal spiral staircase located in the center of the living room. The baseboard heaters didn't allow me to hang the coveted ceiling to floor drapes I desired, (because of the potential fire hazard) and the spiral staircase made arranging furniture a special challenge. 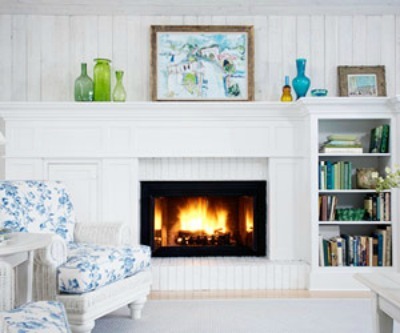 In your home it may be a fireplace, an angled wall, inconveniently located doorways or windows, built-in bookcases, an air conditioner, a bulky radiator, or floor vents. 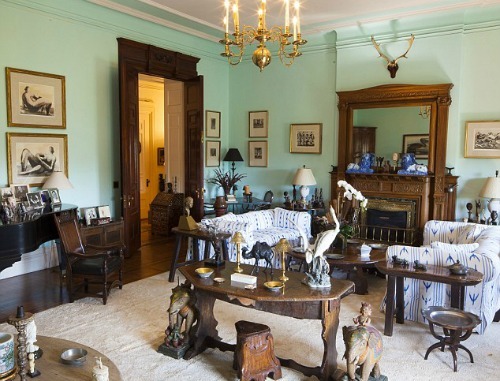 Before you begin arranging furniture, you need to pay attention to these details. Fireplace - A fireplace is a desirable feature for most home buyers; they make wonderful focal points, and provide a warm, comfortable place for reading and visiting. You need to take care when arranging furniture near a fireplace, because of possible sparks flying out. Baseboard heaters, radiators and vents - All of these heat sources need at least 6 inches of space to operate effectively and safely. Be careful when arranging furniture around heat sources. Don’t allow furniture or window treatments to touch radiators and baseboard heaters, and keep floor vents clear as well. For inconveniently located floor vents, you can buy affordable vent deflectors that direct the air flow out and across the floor rather than up toward the ceiling. These can be found at any home improvement center, like Lowe’s and Home Depot, or on Amazon. Air conditioning wall units - The front-air blowing units need about 6-8 inches of space to operate efficiently. Again, don’t shove your furniture right up against an air conditioner. Windows - Furniture should be a least a foot away for easy access to open and close. Doorways - Make sure that you establish the “traffic patterns” of each room when arranging furniture. Avoid having to walk into or around furniture as you enter or exit a room. I dare you to get through this room without stubbing a toe! A traffic pattern is the natural flow of people traveling through a space, the paths in and out of a room, and the areas where you walk the most. In carpeted rooms, you will often see a lot of wear in the carpet where the traffic patterns occur. With proper space planning, there should be enough room for people to travel comfortably in and around the furniture or through the room. It’s important to establish your traffic pattern before you begin arranging furniture. Watch out for door swings and windows; you will need room for opening and closing them. You should have a comfortable 24” of space in which to maneuver in and around furniture. Create conversation areas by placing furniture no more than 8 feet apart. Any farther than that and people will have to exert themselves to be heard. The main seating area should be approximately 8 to 9 feet from its focal point. See staging your furniture. Establish a traffic pattern where people can move easily around a room. A comfortable distance is about 22 inches to 3 feet of maneuvering room. A comfortable distance for television viewing is 3 times the size of your screen. For example, if your television screen is 32 inches, your furniture should be a distance of 8 feet away from it. In the dining room you should have about 2 to 3 feet between the walls and the chairs, so people can get in and out of their chairs comfortably. In bedrooms, you need enough space on each side of the bed. Ideally, you should have enough room for a bedside table and reading light on each side of the bed. Leave at least 3 feet of room between the foot of the bed and the wall when arranging furniture.